Conor Ferguson will hope to add to his 2017 medal tally after being named in Ireland's team for the European Short Course Championships in December. The Jordanstown teenager will travel to Copenhagen to complete a year which has included winning European and world junior silvers. Ferguson is among five swimmers from Ulster in the 10-strong team. Calum Bain, Conor Brines, Danielle Hill and Jordan Sloan complete the Ulster contingent. Mona McSharry, Darragh Greene, Brendan Hyland, Alex Murphy and Nicholas Quinn will also compete for Ireland in Copenhagen on 13-17 December. Ferguson broke his own Irish 100m backstroke record in winning gold at the Amsterdam Swim Cup at the weekend. 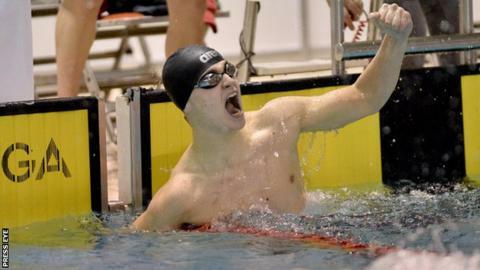 He also won the 50m backstroke while McSharry secured breaststroke golds in the 50m, 100m and 200m. "This team forms a large part of the core group of athletes that we have identified as our primary prospects for the next Olympic Games," said Ben Higson, National Senior Team head coach. "It will be good for me to see them race for the first time in a Championships environment, particularly as I work with most of them as either full-time or in-touch athletes within the National Centre in Dublin."